01.06, within the framework of the Ukrainian Urban Awards, Our Lybid Foundation will present a project for the revival of the legendary metropolitan river “Lybid, a look into the future”. 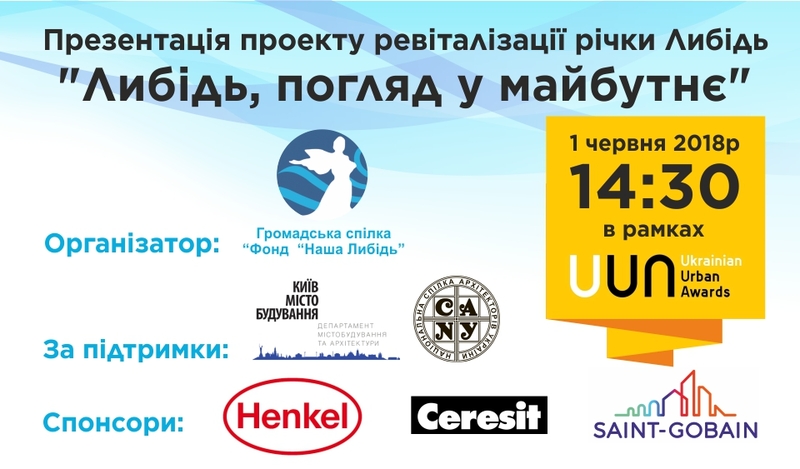 Tomorrow at 14:30 in Parkovsky Exhibition Center a presentation of the revitalization project of the part of the coastal area of ​​the river within the limits of Fedorov and Yamskaya streets will be held, developed by a team of young talented Ukrainian architects. We remind that in 2017 the Our Lybid Foundation announced the All-Ukrainian Architectural Competition “Revitalization of the Lybid River Coast”, the first round of which allowed organizers to select creative, talented, and initiative specialists to create a powerful project for the revival of the legendary river. The winning team of Yulia Karas, Eduard Karas and Alexander Krivenko will present the results of the second round of the competition tomorrow. The presentation will take place at 14:30 on the exhibition stand “Architecture of Change”, located in the hall №1 to the right of the audience hall near the jury room. Anyone who wishes to attend, please contact the event organizers at +380 67 654 77 71 and receive your Ukrainian Urban Awards entry ticket. Thank you for your attention and support in the struggle for the revival of the important water artery of the city!